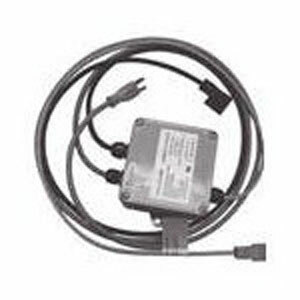 Solenoid/remote alarm junction box, 120V for UV Max D4/D PLUS, E4/E PLUS, F4/F PLUS series. UV Max recommends the use of a solenoid valve on all monitored UV disinfection systems that are installed. A solenoid valve is an electromagnetic device which moves a plunger up and down when a current is passed through a coil that surrounds the plunger. The solenoid is a valve which is required to default to a desired position, referred to as fail-safe, upon loss of power or a major alarm condition (a drop in UV intensity). Therefore the water flow will stop if there is a loss in power, a lamp failure or a loss of UV dose, giving added security to your UV system.